You must have heard about recent release of the book “How to to become billionaire by selling NOTHING” This book is written by blogger Mr.Aditya Magal. He runs blog on the name of “Rakesh Jhunjhunwala”. As the name of rakesh jhunjhunwala is involved I tried to find out how this book can help our readers. This book is work of fiction about entrepreneur who wanted to sell a product called NOTHING. He approached billionaire Rakesh Jhunjhunwala who dismissed his idea and gave Rs 1 lakh asking him to seek help of psychiatric. The Entrepreneur invested this money to manufacture nothing and assign some stake to Rakesh Jhunjhunwala in the company as a sign of gratitude. Stock of this company climbs high as filmstar, politician displays interest in nothing. At last company was sued by other company because of idea copy. Only invest in business that you understand. Entrepreneurs sees opportunity in everything even in “NOTHING”. Yes! Rakesh Jhunjhunwala became billionaire by adopting Investment strategies “Not selling anything”! Rakesh Jhunjhunwala investment strategy says “Buy right and hold tight”. Select right stock and stay invested in this stock. He is holding Titan Industries and Lupin since long and he is still making profit from this stocks. His one of the largest shareholding Lupin went up more than 48% in 2 years. Similarly Titan Industries gone up by 24% and CRISIL by 18% in last two years. Apart from profit this stock are giving him regular income as dividend. 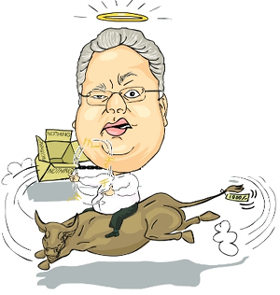 Rakesh Jhunjhunwala always says you have to “Ride your Winners! !” In interview it was asked to Rakesh Jhunjhunwala When do you sell your multibagger?” Rakesh Jhunjhunwala answer was “Never”. Rakesh jhunjhunwala syas that don’t sell stock for the sake of selling, rakesh Jhunjhuhwala explain two situations when he sell his stock. First situation if he is in need to capital to invest in other stock that will give him even better return. Second situation when the stock market has become so irrational that the perception of earnings and the P/E is unsustainable. Conclusion: If Jhunjhunwala became billionaire by not selling anything you can also become billionaire by not selling anything. If you like this post, do share this post with your friends!